It’s bluebonnet season in Central Texas! Snapping a photo in the fragrant fields is a Texas tradition–and one that includes ALL the members of the family, both two- and four-legged…. Win a #WestPawGo Collar and Leash Set! I believe this project actually helps educate people on both pitbulls and "wolfdogs" by reducing overbreeding and showing how wonderful blockheads can be as mentor dogs. Good work. I love holidays – especially now that I have kids – but I tend to prepare for them later than I probably should. In fact, I just remembered yesterday that Easter is this Sunday. Oops. Never fear though, fellow last-minute bunnies. 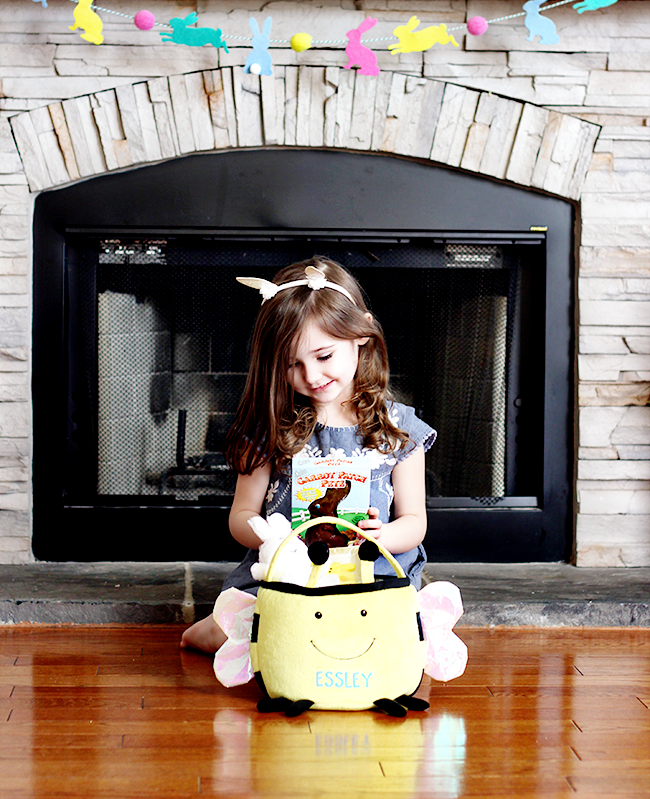 I have compiled a list of fun Easter basket fillers you can easily grab at a local store, via Amazon Prime (my go-to), or even around your house that will make your little ones’ basket as full of joy as if you’d planned way ahead. 1. Eco-Friendly Easter Grass I remember finding pieces of plastic Easter grass under the sofa in, like, October as a child. I also cringe at the thought of how much of that stuff sits in landfills. You can get biodegradable or recycled paper Easter grass at Target, on Amazon Prime, or at most local shops, or if you have a paper shredder, make it yourself. If you’re really running behind, crumbled tissue paper looks really pretty too. 2. Books This is another item you can grab last minute almost anywhere (even grocery stores have kids’ books these days). I like to use spring-themed books. This one is a current favorite around here. 3. Movies If you don’t have time to order a DVD or BlueRay, or to run to the store to grab one, buy one for immediate download (like I did for Coco and will also be doing for Ferdinand), print out a picture of the movie, and put that in the basket. 5. Stickers This is another item you can find almost anywhere. We loved these reusable Easter stickers. 6. Fruit I always throw an apple or banana in my kids’ Easter baskets, depending on what we have on hand. And surprisingly, despite the candy that accompanies it, they love it. And you can’t get any easier. 7. Sunglasses I love gifts that are easy and practical! You can find sunglasses in most stores this time of year because the spring lines have just launched. I just got this adorable pair of cat eye sunnies for Essley at Target. 8. Money My kids love the idea of saving money in their piggy banks, and when they get a dollar, they are beyond stoked. I usually roll up a dollar bill and tie it with ribbon for their baskets. Easiest gift ever. 9. Easter Candy Duh. There are only a few times a year my kids get to sugar binge, and there really isn’t an easier last minute gift to grab. 10. The Basket! Okay, so this isn’t a filler idea, but it is necessary, so I’m including it. It’s really easy to get creative with this even if you’re really behind. When I was a kid, my parents always used unusable objects for Easter baskets that we could reuse. My favorite (that I still have and now use for my mail) was a vintage hat box with bears dancing on it. You probably have baskets or containers you’re not using at home that would work well. Or some of my favorite places to buy Easter baskets are Personal Creations (as seen in image above), Target, and Pottery Barn Kids. If you have any other great ideas for easy, last-minute Easter basket goodies, I’d love to hear them! We’ve been in our new home for two months now, and we’ve officially gotten one whole room painted (Essley’s). To be fair, Robbie has been on the road a lot of this year so far, so there hasn’t been a lot of time to for us to work together on this place. That certainly hasn’t stopped us from planning through. 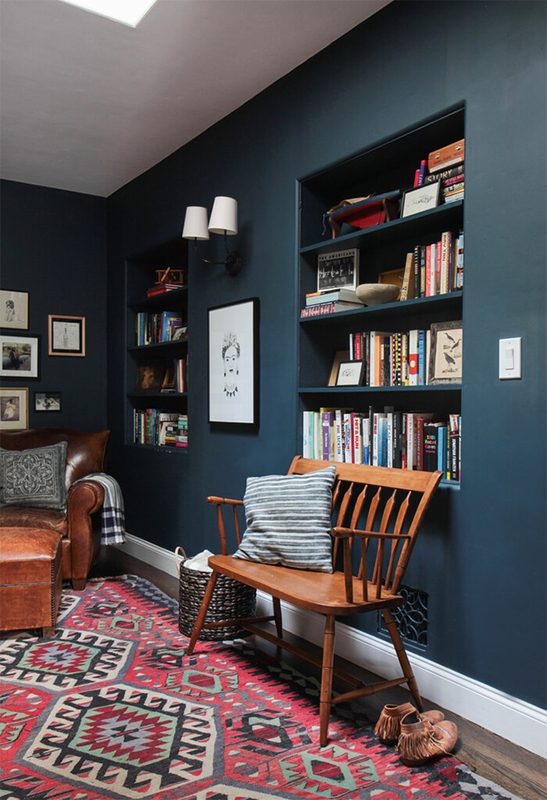 The paint colors in this space aren’t terrible, and the old owners did a really nice job in terms of painting well. 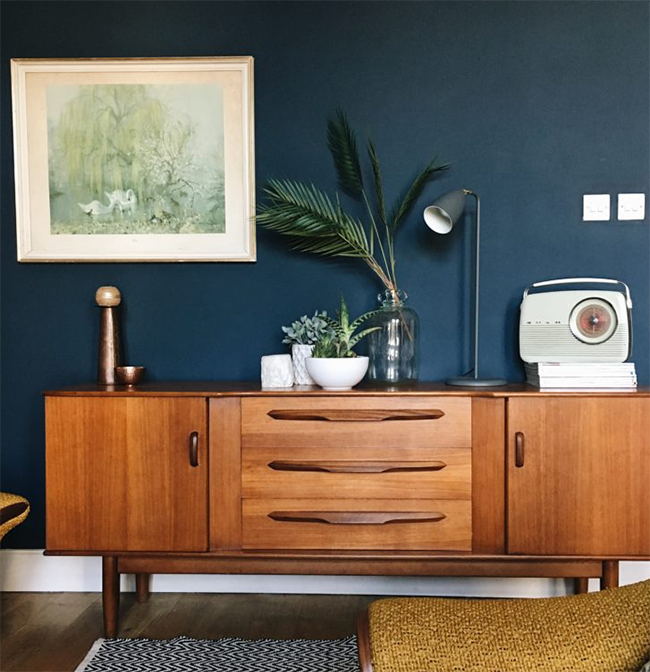 Right now we’ve got beige front rooms, a dusty blue-grey living room, yellow hallways, and a mustard-beige color in the kitchen. And they look fine, but they’re not our particular style. 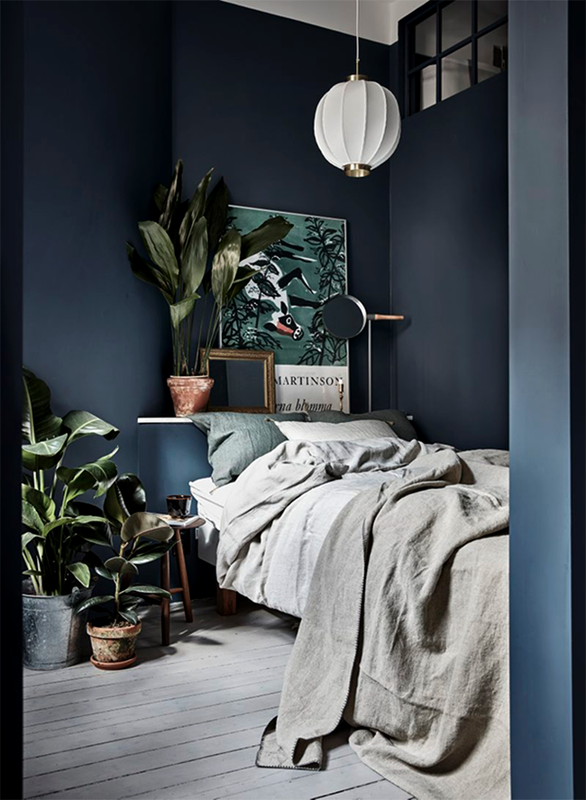 In terms of paint, we actually want to eventually redo most of the house – the master bedroom is the only room that came in a color we would have chosen for it. 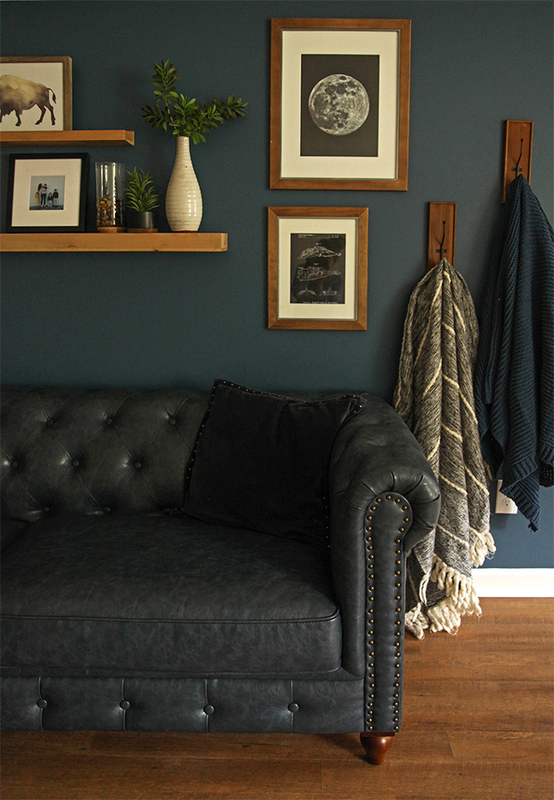 Now because I know us, I can confidently say that most of our walls will probably end up grey. But I want to make at least some of them something different. 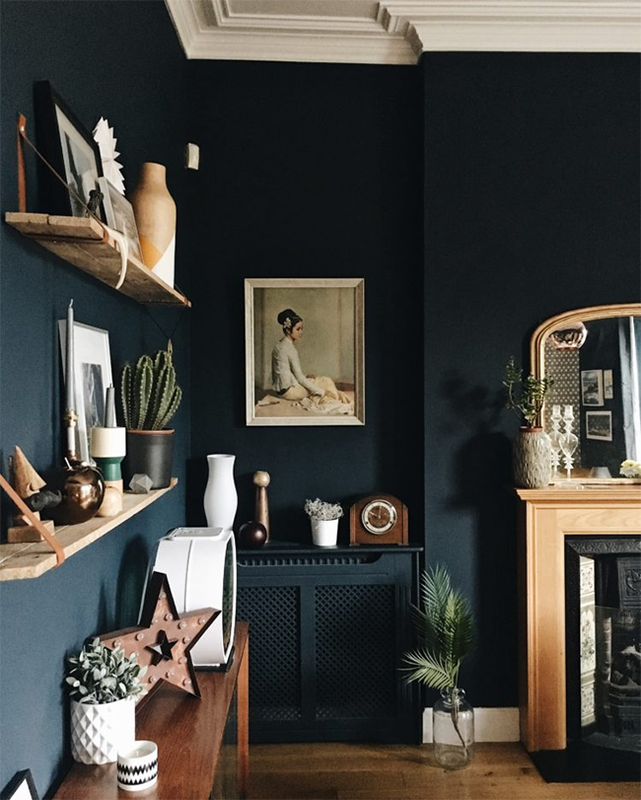 I love the way all white spaces look, and probably will paint over the beige in the front rooms with a bright white, but I see trends moving away from that and toward more moody colors. And the one that I find myself falling more and more in love with is deep, dark blue. 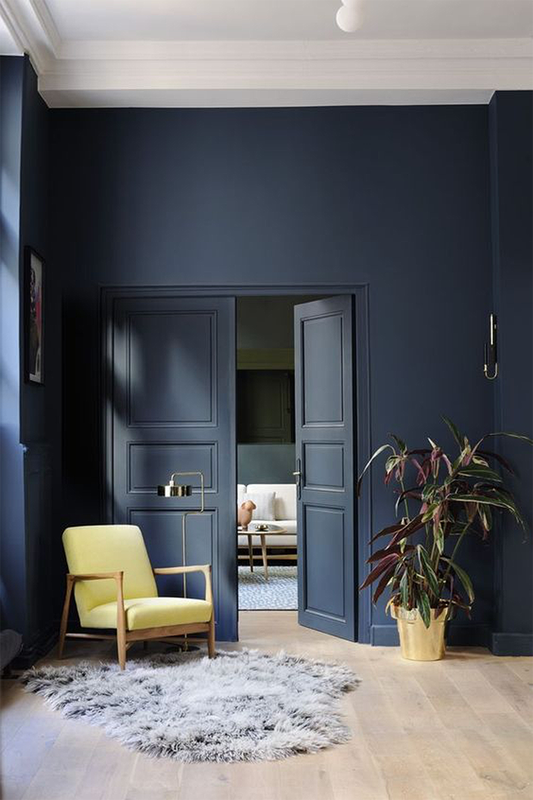 So today, I thought I’d share some of the spaces painted in this color that are inspiring me right now. 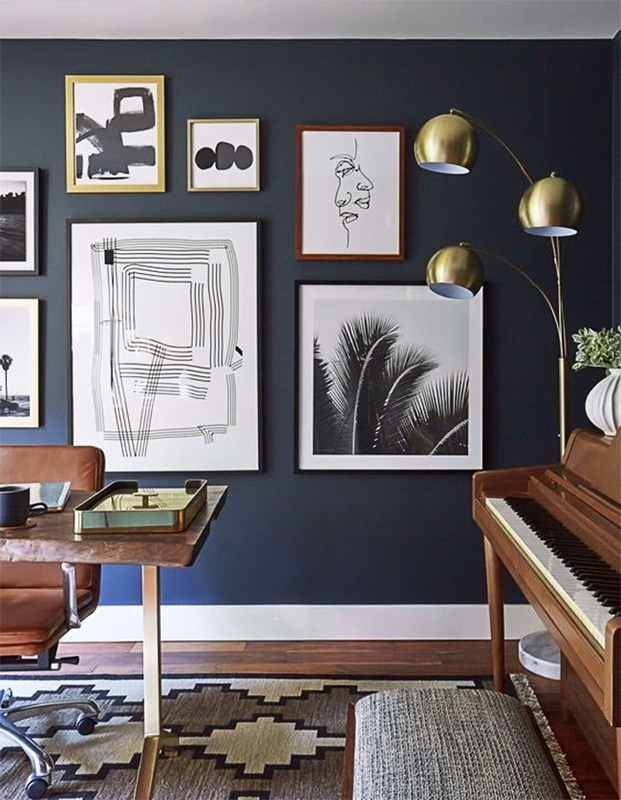 I generally prefer light, airy rooms, but there is something so inviting about a deep blue wall (or walls). And I feel like it goes with most other colors, almost like a neutral. IMAGES FROM TOP: 1. Domino | 2. Around The Houses | 3. In Honor of Design (my beautiful friend Anna’s gorgeous shared boys’ room) | 4. Apartment Therapy | 5. Around The Houses | 6. Emily Henderson | 7. 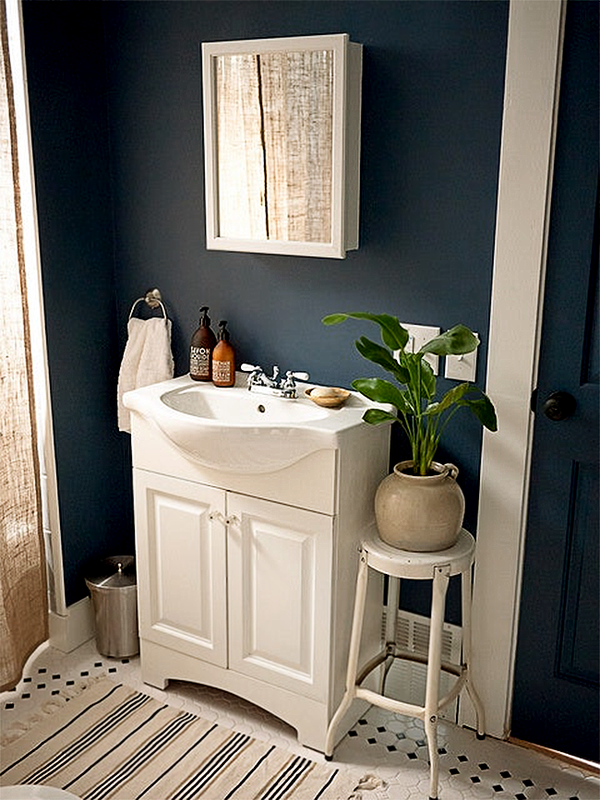 Marie Flanigan Interiors | 8. Found on Pinterest; anyone know original source?